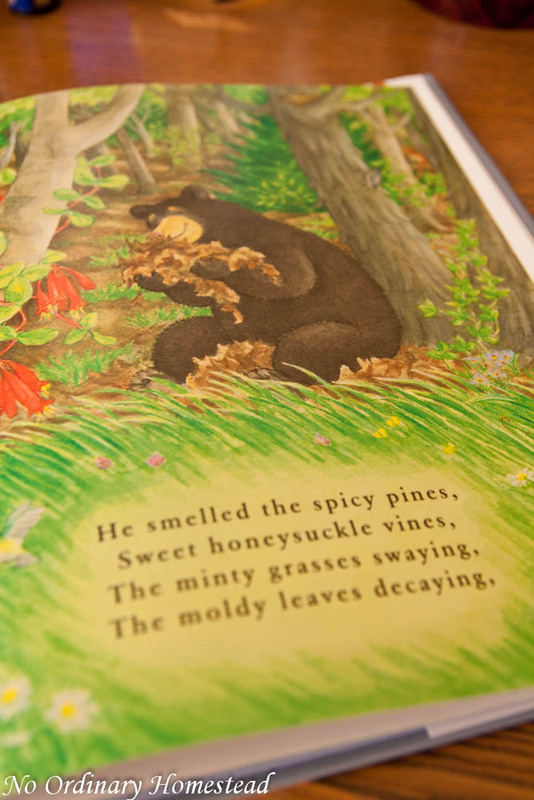 The happy, brown bear in this story is an on an exploratory mission to discover what is over the mountain — and when he gets there, he encounters all sorts of things to stimulate his senses of sight, touch, smell, sound and taste. He also learns that not all things you explore with your senses are wonderful — like a run in with a skunk or a porcupine! As he’s traveling and exploring, the seasons are changing around him, and ultimately the bear settles into a long winter’s nap after such an amazingly stimulating year. 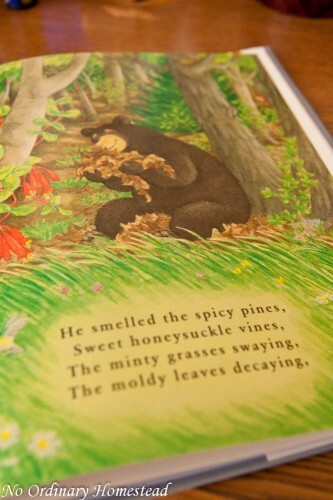 The Bear Went Over the Mountain is beautifully illustrated with colorful images that are full of detail. On every page, you find lots of animals hiding in the trees or flitting through the sky. The really bring the story to life and make it interesting for younger kids as well. If you’re musically inclined, there are musical notes on the last page along with the words for each verse so that you can have your own sing-a-long. This makes it even more suitable for classrooms and music groups who may be looking for new ideas. Plus, if used in a classroom environment, you can take the kids out after reading the book to explore their surroundings and develop their senses further. Iza Trapania, the author, has written and illustrated many children’s book, and particularly loves to retell and expand upon those classic nursery rhymes that we’ve all grown up with. Her book, The Itsy Bitsy Spider, has actually sold over one million copies and she’s won multiple awards for her works. Although Mackenzie does not typically take to new books quickly, and is extremely selective about what we read before bed, she really seemed to enjoy this book and as I was photographing it today, she was talking about, “The bear went over the mountain, the bear went over the mountain.” I was pretty impressed by this, because we haven’t read it in several weeks, thanks to the latest Berenstain Bears kick she’s on. Buy it for your little one today at Amazon.com or learn more about the book at Skyhorse Publishing. 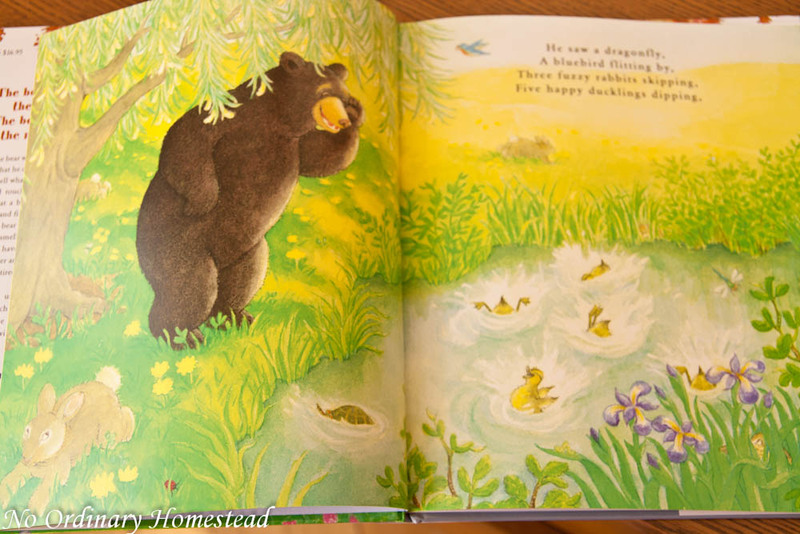 Disclaimer: I received a free copy of The Bear Went Over the Mountain to review. All opinions expressed in this review are my own and I received no compensation for them.